A good mother plant fertilizer should provide enough Nitrogen to support a healthy root to shoot ratio, but not so much Nitrogen that the plants has to burn up most of its stored sugars just to assimilate the nitrates. Mother plants are stock plants specifically raised to provide cuttings for starting new plants. The cuttings, also known as clones, are genetically identical to the mother plant, and if grown in a controlled environment will develop into daughter plants with the same superior characteristics as the mother plant. Since cuttings take time to develop roots, the clones must rely on stored water and carbohydrates in the stems and leaves to provide the energy necessary to develop vigorous new roots. Therefore, plant nutrition for the mother plant is critical to the rooting and recovery time of the tender clones. The plant nutrition requirements of mother plants are significantly different from those of production plants raised for optimal yields. 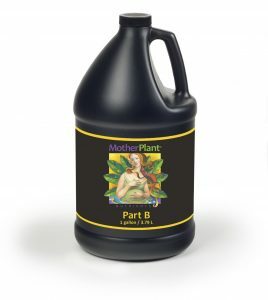 Mother plants require a balanced nutrition specifically formulated to slow down excessive vegetative growth and increase the carbon to nitrogen ratio in the shoots. If a mother plant is fertilized with too much nitrogen, it will grow quickly, but it will produce soft tissues with poor carbohydrate reserves. About 25 to 30% of a plant’s energy is used to change nitrates into an organic form of nitrogen used for vegetative growth. So an over abundance of nitrates will deplete the sugars in the shoots and leaves, reducing the amount of fuel available for new root growth. A good mother plant fertilizer must also be formulated to strengthen the plant’s cell walls and improve its water-holding capacity and stress tolerance. Excess nitrogen fertilization, as found in many plant nutrition formulas, produce large plant cells with thin cell walls. Cuttings taken from the new growth of overly-vegetative plants tend to be weaker and more susceptible to wilting and fungal infection. Again, reducing the amount of nitrates in the mother plant fertilizer to the low to medium range will be helpful, but the ideal mother plant fertilizer should also be formulated to stimulate the uptake of calcium. Calcium is taken up through the roots and transported to the new growth, where it forms the calcium pectate “glue” that bonds the cell walls together. A calcium-rich mother plant with stronger cell walls can take up water and nutrients more efficiently, allowing more sugars and nutrients to be stored for future use. The use of bio-organics in a mother plant formula can dramatically improve the mother plant’s uptake of calcium and other essential nutrients. In conventional hydroponics, calcium ions are dissolved in the nutrient formula and are taken up into the roots through simple osmosis. But if organic biostimulants with a blend of specific amino acids are added to the nutrient solution, calcium ion channels in the roots are opened, allowing calcium to be taken up thousands to millions of times faster than simple osmosis! The calcium is then used to build strong, new cell walls and to improve the plant’s natural resistance to environmental stress and disease. Higher levels of calcium also tend to restrict the transport of excess nitrates to the shoots, producing plant cells with smaller, but thicker cell walls, ideal for vigorous clones. Other bio-organic compounds are known to stimulate the production of important plant protection agents. For example, in a ten-year study of biostimulants researchers at Virginia Tech discovered that a combination of seaweed extracts and humic acid stimulated the plants to produce increased levels of vitamin E and other important anti-oxidants. Specific enzymes are produced that protect the cell walls, the chloroplast membranes and the mitochondrial membranes during times of heat and drought stress. Since cuttings from mother plants are under extreme stress, the heightened levels of plant protection agents accumulated in the mother plant will help sustain efficient metabolism and ensure the survival of the clones until they can develop their own root structure. Seaweed extracts can also be used as a foliar spray for mother plants. Seaweed extracts are known to be rich in cytokinins, the growth hormones that stimulate cell division. Research shows that when cytokinins are applied to shoots, nutrients are attracted towards the growth hormones and are drawn into the leaf tissues. Cytokinins also help keep the plant tissues in a juvenile state and stimulate the development of more lateral buds. Therefore, it is beneficial to start spraying seaweed extracts on the mother plant a couple of weeks before cuttings are to be taken. Foliar sprays, when used in conjunction with a well formulated mother plant fertilizer, can be thought of as “stage zero” of plant propagation from cuttings.